We had so much fun with this quilt! It was nice to take a break from squares and rectangles to cut and piece these isosceles triangles together. We also enjoyed steering away from some of the bright colored fabrics we usually use and we went for a gold metallic highlighted by white and black. 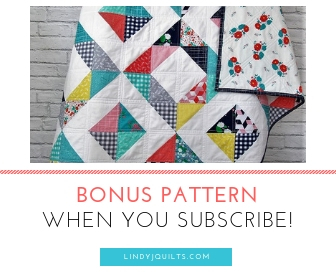 Have you been wanting to make a Triangle Quilt? Well, read on – We created a SkillShare class on how to make a Triangle Quilt! We’re still trying to figure out how to calculate how much fabric you need for a triangle quilt. We thought we took into account ¼” seam allowances, but once we started piecing, we realized that this type of pattern ate up our fabric! Maybe it was the angles??? Anyway, we didn’t want too small of a quilt, so we ended up buying a little more yardage of our favorite gold and white prints (details in this top’s Fabric Friday post) and cutting more triangles. The quilt top still shrank some more when we sewed the vertical strips together. We had to use close to a ½” seam allowance to get the triangle points to measure up. But it was worth the extra math and extra yardage. This quilt top has a designer look with its shimmery metallic gold and its little pops of black. Definitely one of our favorites. For the binding, we used the same Cotton + Steel Sprinkles in Black that we used for the black triangles – it really frames the quilt nicely! For the back, we used a fun black and off-white circle pattern called Metro Circles in White by Robert Kaufman. It’s so cool seeing triangles on one side and circles on the other! We quilted this quilt in the ditch and that’s all this quilt needed. The back has a cool quilted diamond pattern – it has such a nice drape and feel! And it photographed way better than I thought it would. Don’t you love the sparkles? Photographing our quilts is something I struggle with and work on ALL THE TIME. I wish I could convey the sparkles and the lightweight drape in these photos! The finished quilt measures: 42” x 46” – It’s the perfect size for an infant tummy time mat, toddler quilt or lap quilt. It will be adorable in a nursery. We have listed this Mizzou Baby Quilt in our shop and if the size and colors aren’t quite what you’re looking for, check out our custom quilt listing for this triangle pattern. We’d love to make a quilt just for you! Now on to finishing up our Blue and White quilt – that one’s a a beauty! Stay posted!